So starts the adventure of Bobby Pendragon. At age 14, Bobby Pendragon is living the normal life of a teenage boy. He is on the Basketball team, has a good friend, Mark, and has just kissed (tongue and all) the most beautiful girl in school, Courtney Chetwynde. Bobby’s Uncle Press interrupted the kiss thus severely embarrassing both Bobby and Courtney, who, much to Bobby’s chagrin, decided to leave. Instead of letting Bobby go to the championship basketball game, Uncle Press tells Bobby he needs him to help him, but does not give him any details.The two take a motorcycle ride into Mid-Town Manhattan (New York City) and enter a deserted subway station.There Bobby and Uncle Press encounter the evil Saint Dane, and Bobby has to run for his life. While Uncle Press keeps Saint Dane busy, Bobby runs to find the special special door Uncle Press told him about. If he finds it and if he gets past the monster “quigs”, he is to mutter the word “Denduron”. Bobby barely makes it to, and through, the door then says the word “Denduron”. Upon uttering that word, Bobby is transported in a flume to the Denduron territory that is in a different dimension than where he came from: Second Earth. Uncle Press shows up shortly thereafter. At Denduron, Uncle Press and Bobby (and other travelers, Osa, her daughter Loor, and Alder a traveler from Denduron) are to help the Milago people in their revolution against their oppressors, the Bedoowan. The Milago are forced to work in horrible conditions in the mines so that the Bedoowan have a steady supply of the precious stone “glaze” that the Bedoowan then sell for a healthy profit.The Milago are slaves and are murdered at the whim of a powerful Bedoowan, who happens to be Saint Dane in disguise.Yup, he is an evil dude. The book unfolds as a Journal written by Bobby and read by Mark and Courtney.The night after Bobby disappeared with Uncle Press, a visitor came to Mark’s bedroom and gave him a ring.This ring turns into a portal for Bobby to put the Journal into for Mark to retrieve.Very cool. 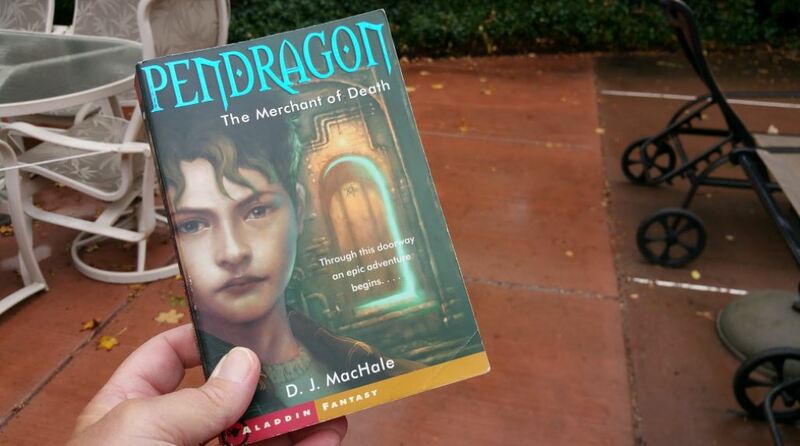 “Pendragon, The Merchant of Death” is an action filled fantasy with very interesting characters and situations.Although it was a bit slow for me to warm up to, by the end of the book, I had become a fan.I am looking forward to reading the next book in the series. Side Note: My daughter wanted me to read this, and I reluctantly agreed (I mean come on, I’m an old guy and this is a kids book). The argument that “Harry Potter” is also for kids got me to try it and , additionally, D.J MacHale and my daughter have emailed each other for the past 5 or 6 years. He is truly a nice person.